Vitamin C is not only a nutrient essential for the body but also highly applied in beauty technology. If you are interested in skincare, the more you can not ignore products derived from vitamin C. However, some sensitive skin will be inadequate with this vitamin because of their powerful treatment. But MediskinbyC Pure C + Recovery Brightening Cream is not. This will be a very worthwhile experience because this product is completely benign due to its natural origin. Your skin will be flawlessly smooth and you will not face acne problems or any unnecessary irritation. 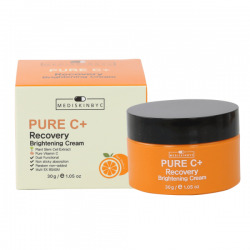 MediskinByC Pure C + Recovery Brightening Cream is pure C + with pure and pure vitamin C extract. This product is copyrighted by MediskinbyC - a famous Korean cosmetic company committed to using raw materials completely from nature. Used at the end of the skin. Apply a small amount of cream evenly over the face and neck. Massage gently from the inside out and pat onto the cream to be quickly absorbed into the skin. 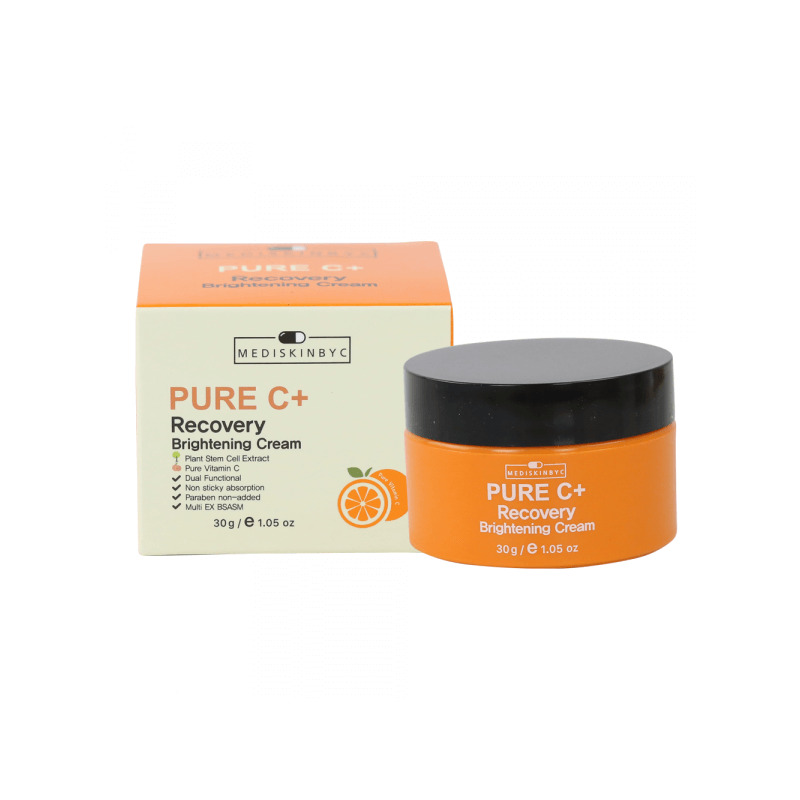 MediskinByC Pure C + Recovery Brightening Cream contains vitamin C, which is purified from fruits and herbal oils. This ensures that this product will deliver the best skin care results and will not cause irritation or prickling, even for sensitive skin. MediskinByC Pure C + Recovery Brightening Cream has the ability to bring out flawlessly white skin, while being extremely smooth, will definitely make you as confident as possible. Vitamin C extract can cleanse all dead skin cells, facilitating skin absorption of the whitening ingredients incorporated in the moisturizer. At the same time, the melamine darkens the skin will be destroyed, the skin is corrected through the pigment balance. The problem of freckles, freckles will not be your concern anymore. This product gives you a 5-star skin that is extremely bright and rosy. MediskinByC Pure C + Recovery Brightening Cream will be a "phthalate" for skin problems with scars and lesions as the ability of the product to regenerate and form new, resistant skin cells. The bacterium also treats the wounds on the skin. Even if your skin is exposed all day with harmful UV rays, this product can still soothe your skin immediately. You will have to admit to the quick recovery of your skin thanks to this lotion! With essential oils of jojoba and camellia, the skin will always be moisturized. One highlight is that although water is supplied to the water but also controlled excess oil, regulate the route by efficiency. The surface is always dry but still very smooth. MediskinByC Pure C + Recovery Brightening Cream has a small plastic box shape with orange body and prominent black lid. On the box packaging paper products with vitamin C icon from oranges (lemon) is also a major component of the cream. Once you open the lid, you will see a layer of plastic that acts as a stopper to keep clean and protect the wireless cream from the box. The texture is smooth and white and the aroma is very pleasant. Light cream does not stick or clog pores.